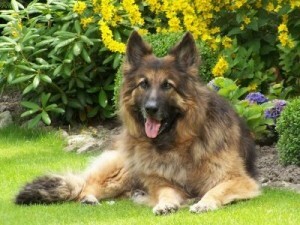 About hunderd years ago, all hair types were very common in german shepherd dogs. 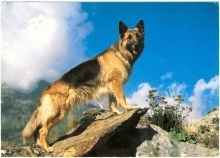 The breeding of german Shepherd dogs according to the breeding standard was more difficult than it is today. Even mating with wolves occurred…. The result was, that the first pedigree of the german shepherd combined all these possible properties in their genes. The german shepherd as we know it today, still has parts of these genes. With rigorous selections in the breeding program, the hair type in german shepherds is now mainly reduced to three types: stock hair, long stock hair and long hair. Normal stock hair German Shepherds are the most common types. The individual hairs are straight, coarse and lay against the body. Their coat is short on the head, front of the legs, hind legs, and the feet and toes. It is longer and thicker on the neck, and back of the fore and hind legs. 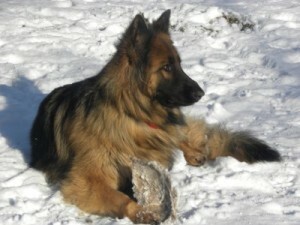 Long stock hair German Shepherd individual hair is longer and does not lie close to the body. Their coat is considerably longer inside, behind the ears, and on the back of the forearm. The thighs are usually long and thick with a bushy tail with feathering underneath. Long stock hair was considered to be a disqualifying fault until 2010.Now this has been accepted into the standard. The long haired German Shepherd coat is considerably longer than the long stock hair. It is usually soft and forms a parting along the back. Occasionally, there will be an undercoat along the loins or none at all. Long hair is considered to be a disqualifying fault, and these dogs should not be used for breeding.